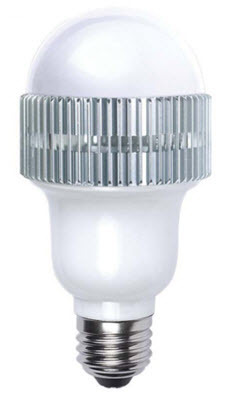 LED emergency light bulbs with 5500K light color are a 5 watt providing the light you need with extremely long life while having an emergency capability. It recognizes the power outage and comes on automatically. This LED lamp uses a lithium battery and patented technology to stay on for additional 90 minutes when power shuts down as a result of sudden blackouts or natural disasters. It can also be used independent of the light fixture it's used in, so you can take it anywhere. During emergency operation when it has 10 minutes of power left, it will flash 3 times to notify you of that. - For 120 volt applications. - 25,000 hour average rated life. - 360 degree beam spread. - A19 standard light bulb. - Contains no mercury or hazardous substances.